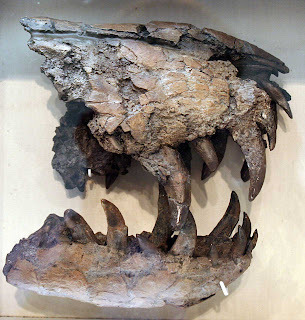 This is a cast of juvenile Tyrannosaurus rex jaws/teeth found in Montana in 1966. Studies have shown that it was less than 3 years old when it died. The skull shape differs from a mature animal and was once thought to be a different species. 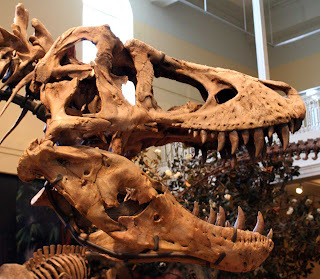 These fossils were on display at the Carnegie Museum for Natural History in 2011. Here is the mature skull shown in an exhibit at the museum. Discovered at Hell Creek, Montana and given the accession number CM 9380. This carnivore prowled the plains of the western United States and southwestern Canada in the Late Cretaceous Period (68-66 million years ago), Mesozoic Era.